Recent years have seen a rapid growth in the field of applied optics and optoelectronics, mostly from the standpoints of industrial applications and research. This has largely been due to the advantages that optical technology offers in a wide range of situations and thus the research into and anticipation of future applications is an area that is subject to considerable international interest. 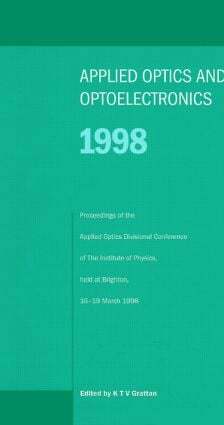 Applied Optics and Optoelectronics 1998 incorporates a broad spectrum of scientists and engineers from around the world. The book includes contributions from the IOP Optical Group, Instrument Science and Technology Group, and the Fringe Analysis Special Interest Group, and the wide range of contents reflects the interdisciplinary nature of the subject that will help to facilitate the cross fertilization of ideas within the community. The proceedings comprise papers from the following program streams: optics; actuators, sensors, and instrumentation; fringe analysis; and underwater optics. "This book is a valuable addition to the literature of conference proceedings and will provide valuable references for researchers in the field of optics for a long time to come."